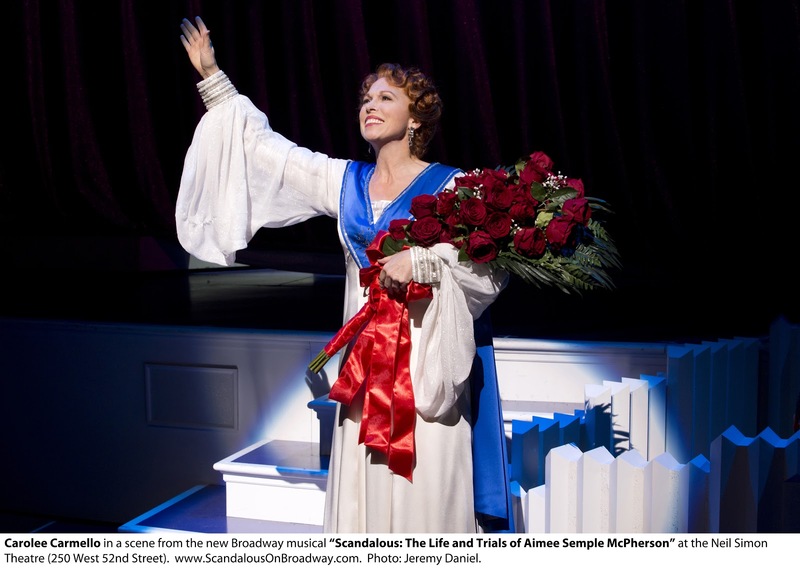 Actress Carolee Carmello is nothing short of stupendous as the lead role in the Broadway musical Scandalous: The Life and Trials of Aimee Semple McPherson (book, lyrics & additional music by Kathie Lee Gifford, music by David Pomeranz and David Friedman), her performance being more than reason to see the show. Sadly, there is little else to recommend the musical, which is saddled with multiple problems, the chief of which being the material never delves too deeply into its subject matter. Purporting to tell the story of Aimee Semple McPherson (Carmello), the musical, after a brief prologue, introduces the audience to the character as a teenage girl in 1907 Canada. Dreaming of becoming an actress, Aimee is constantly at odds with her pious and upright mother, Minnie Kennedy (Candy Buckley). Things change for Amy when she meets and falls in love with Robert Semple (Edward Watts), a young Irish Pentecostal minister, who will become her first husband. Though she finds herself open to the teachings of the Bible for the first time, it is only after a near-death experience that she finally listens to the voice she has heard inside for so long, which tells her to preach the word of God. Holding revival meetings across the country, Aimee encounters both setbacks and victories - the latter including Emma Jo Schaeffer (Roz Ryan), a former madam of a Kansas City whorehouse, who becomes a convert to her cause. Upon seeing the tremendous attraction of moving pictures, Aimee has an epiphany of sorts and combines the flashy techniques of show business with her religious message, thus allowing her to reach ever larger audiences. Bringing her movement to Los Angeles in 1920, she becomes the darling of the media while earning the scorn of several religious leaders there - including one Brother Bob (Hearn). It's not long before she's hobnobbing with the Hollywood elite of the day, all the while putting on more and more elaborate biblical presentations for her growing congregation. She also becomes a national figure thanks to the new medium of radio. Though her professional star continues to rise, the private life of this twice married, once widowed, once divorced woman becomes the continual focus of speculation and gossip. There's the matter of Aimee's relationship with actor David Hutton (Watts), as well as with the married Kenneth Ormiston (Andrew Samonsky). Plus Aimee's unfailing devotion to her cause and the ever-growing pressure of holding together her empire begin to put a strain her health, driving her almost to the point of breakdown. With so much material to play with, McPherson's life would seem to be a natural fit for a musical stage adaptation. Unfortunately, what's offered seems like warmed-over second and third hand information, rather than a full exploration or understanding of the people involved. There is almost no information given about Robert Semple; there's even less insight into Aimee's second husband Harold McPherson (Samonsky); and Aimee's various children are mentioned but never seen, thus depriving the story of several important sources of backstory narrative. This ongoing problem is especially evident when dealing with Aimee's mysterious 16-day disappearance, where she seemingly vanished off the face of the earth - an event which made national headlines. McPherson claims she was kidnapped, though that was a matter of dispute. Unfortunately the musical doesn't take a position on what happened, the characters basically speaking words and offering solutions that seem to come from tabloid magazines rather than anything with real substance. Much of the fault here has to rest with Gifford, who's been working on this project for years, but who never seems to have gone the extra mile to put a different spin or fresh take on information that was already out there for decades. As mentioned above, Carmello is titanic in the lead role and the actress does a great job in taking Aimee from a young, confused girl to one filled with purpose; having an interesting air of cynical idealism and an unyielding belief in her faith. Carmello's singing is also top-notch. Though with the show offering one powerful musical number after another in continuing succession, the score quickly begins to sound more than a bit repetitious. Buckley is good as Aimee's mother, the only other decently developed character in the piece, a woman who combines religious fervor with a strong no-nonsense attitude. At the same time the character is a mother through and through, having a long and volatile relationship with her daughter - often being the only person Amy can turn to - yet a fascinating individual all her own. Rose does a serviceable job as Aimee's father, though he's a more than a bit stereotypical as Bother Bob. This issue also arises with Ryan's portrayal of Emma Jo - okay as far as it goes; though it's too often only a surface portrayal, one at times verging on caricature. Elsewhere, Watts is pretty one-dimensional in his portrayal of David. This may have been what the creators intended, but there is nothing shown of the character to make him even remotely interesting. Conversely, Samonsky has some potential as Ormiston, but there's nowhere near enough information to allow him to really connect with the audience. Director David Armstrong does his best with the material, but he, like the rest of the cast, is hamstrung by a book that offers only the smallest bit of anything close to being substantial. As a result, the moments of spectacle and glitz come off nicely, but the quieter, softer and more probing ones really do not work. Sets by Walt Spangler are eye-catching at times and the costumes by Gregory A. Poplyk run the gamut from the functional to over the top - all in keeping with the story. Orchestrations by Coughlin are enjoyable, but like the music, one can see a sameness to it throughout. Scandalous sadly falls into the worst of all musical theatre categories. That of a wonderful opportunity totally squandered. Though if Carmello doesn't at least get a Tony nomination for her work here, something is very wrong.